Rent to Own / Owner Financing Available! This HUGE 5 bedroom, 2 bath home has room for everybody!! Large eat-in kitchen with flat-top stove, fridge, dishwasher, and new countertops. Newer flooring throughout including wood laminate in large entryway, vinyl in kitchen and baths and berber carpeting. Great room has wonderful real stone fireplace and french doors leading to spacious back deck, awesome for entertaining friends and family. New vinyl siding, new well pump (2003) and water softener system make this home nearly maintenance free. Large backyard perfect for games and hosting bbq’s. You have to see this home to believe it. Let us help you make a wonderful home for your large family! 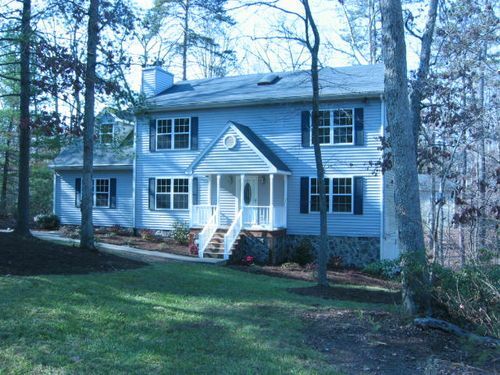 For more information or to schedule a time to go view the house call us today at 434.962.4585 or 434.962.5685. VIRTUAL TOUR to come in the next week! Directions: From 64 West, take the 340/Stuarts Draft exit and turn left onto 340. Drive 8 miles and turn Left onto University Farm Blvd. Go 1/2 mile and house is on your Left. Call the number on the For Sale By Owner sign in the yard if you want to see the inside. This fantastic 3 bedroom 2.5 bath home is located on a corner lot and FULLY RENOVATED with brand new kitchen, stainless steel appliances, carpet, paint, ceramic tile, and antique accents. The kitchen boasts brand new beautiful cabinets with soft close hinges, granite countertops, and brand new stainless steel appliances. Just steps away is a cute dining area on ceramic tile looking out on a brand new back deck and woods. The downstairs basement has been completely finished to include a HUGE den that is perfect for entertaining guests or having as a play/rec-room. A separate room set off to the side would be perfect for a downstairs office or extra bedroom. A spacious laundry room with hanging cabinets and folding space is now available and perfect for extra storage if needed. And don’t forget the back deck! Brand new and welcoming for after work or weekend lounging/cookouts. Enjoy the quiet of the wooded backyard while sitting in your adirondack and reading the morning paper. Only a short drive to the brand new Lowes and Wal-Mart at the 29/33 intersection this house will not last long! Call us today at 434.962.4585 or at 434.962.5685 to get the lockbox code for viewing. Owner financing and Rent-to-Own is available and with all the upgrades and renovations at $197,900 this is a great deal! Directions to 17 Wood Dr. Ruckersville, VA 22968: From Charlottesville, take 29 N into Ruckersville until you reach the light at Rte 33. Turn left at the light and go approximately 3 miles. Once past the light at Amicus road turn right onto STEPHENS LOOP. Go approximately 1 mile and you will see the house on the corner of WOOD and STEPHENS LOOP. There will be a For Sale By Owner sign in the yard along with yellow Owner Financing signs. FOR RENT – 4 Hatchechubee, 5 BR/3.5 BA over 2800 sq ft! RENT TO OWN and OWNER FINANCING also available! Large 10 Room Family Home with 2 Master Bedrooms & 2 Master Baths with Garden Tubs! This wonderful home features 5 Bedrooms, 3 1/2 Baths, hardwood flooring and wall to wall carpeting. This home also includes a first floor family room with a stone front fireplace, and a huge bonus room on the second floor with beautiful wood flooring and a paladian window in addition to a formal living room and dining room. All appliances convey including a “good cook’s” gas range, side by side refrigerator, dishwasher & microwave oven. A large deck overlooks the back yard with wood fencing and gate. Wall to wall carpeting in most of home and hardwood flooring in kitchen and dining rooms complete this beautiful home. Move your family up to this 2830 square foot home over the summer with no bank qualifying needed!! All this for under $100 per square foot! Directions: First call 434-962-4585 to be called into Lake Monticello Security and for the lock box code. Then — From I-64 take Exit # 129 onto 616. At the end of the exit ramp turn right on Route 616, also called Union Mills Road. Drive 5.7 miles and turn right on to Route 600, also called South Boston Rd. Drive 1.5 miles and turn right on Rt. 618, Lake Monticello Rd. Go past the Lake Monticello Main Gate to Cherokee Subdivision on your right. Turn right on Chippewa and go one short block. Turn left onto Seminole and go 1 block to Hatchechubee. Turn right on Hatchechubee and the home is #4 — your first house on the left. NEW PROPERTY – 7 Arapaho Tr, 4BR/3 BA, over 2600 sq ft! RENT TO OWN – OWNER FINANCING Programs Available!!! Outside the gate at Lake Monticello, this 2700 square foot house with four bedrooms and three baths is waiting for you to make it your new home! It’s summer and with front and back porches is the a perfect time to sit outside in your rocking chair on the covered front or watching the breeze blow through the trees while listening to the peace and quiet from your relaxing adirondack chair on the back. When it gets too warm for you, come inside and enjoy taking it easy in air conditioned main room with laminate wood floors, ready and waiting for you to put a nice plasma screen tv above the beautiful inlaid fireplace. The master bedroom is very spacious with a walk-in closet and jacuzzi tub to wind down after a long day of work. Should you have kids, there is PLENTY of room in the fully finished basement to set up an entertainment room or family den. Come winter don’t worry about having to scrape off ice off your cars, because with a two car garage you’ll have the room your need for parking and to keep from having to run out in the rain to start them up. DIRECTIONS: From Charlottesville take 20 S and turn right onto 53 E – Thomas Jefferson Parkway (There is currently a detour on rt. 250). After about 10 miles turn left onto Lake Monticello Rd/State Route 618. Continue to drive about 1.5 miles and turn left onto Chippewa Ln, take your 1st right onto Apache, and your first left onto Arapaho. The house will be the 3rd or 4th house on your right, 7 Arapaho. You will see yellow Owner Financing signs as your enter the community and a For Sale sign in the yard. Ever wanted to live in a tranquil family friendly neighborhood – well now’s your chance! This 3 bedroom 2 bath house has over 1300 square feet of comfortable living space including a large kitchen area with plenty of cabinet space, like-new appliances, and sun lit dining area. On the far end of the last street of the neighborhood, this lot provides plenty of backyard privacy, a shed for additional storage and a front and back porch to relax and take in the afternoon breezes and smells of freshly mowed grass with the distant sound of children playing in the cul-de-sac nearby. Don’t miss your opportunity to make a great house in the valley your home this Spring. Only 5-10 minutes from Interstate 64 with views of Massanutten and surrounding mountains on the horizon. Rent to Own and Owner Financing programs available and at a great price of only $169,900 this will not last long! Call 434.962.4585 or our alternate number 434.962.5685 to schedule a time to go by and see this cozy scenic property! Directions: From I81 take exit 235 E towards Grottoes and the Shenandoah Valley Airport. Drive approximately 1.0 mile and take a right at the light at Keezletown rd. Drive approximately 1.0 mile and turn left at Lofton Dr into the Harshbarger subdivision. Stay on Lofton 0.5 miles until you reach the last street and turn right onto Falcon Ln. The house will be 0.25 miles up on the left before you reach the cul-de-sac.